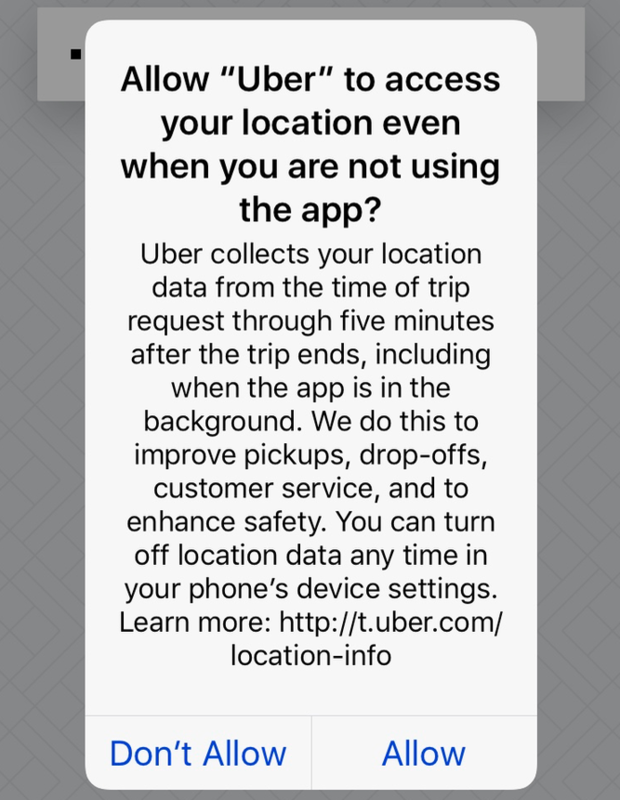 Enlarge / Uber's iOS popup asking for new surveillance permissions. As promised, Uber is now tracking you even when your ride is over. The ride-hailing service said the surveillance—even when riders close the app—will improve its service. The company now tracks customers from when they request a ride until five minutes after the ride has ended. According to Uber, the move will help drivers locate riders without having to call them, and it will also allow Uber to analyze whether people are being dropped off and picked up properly—like on the correct side of the street. We're always thinking about ways we can improve the rider experience from sharpening our ETA estimates to identifying the best pick up location on any given street. Location is at the heart of the Uber experience, and we're asking riders to provide us with more information to achieve these goals. Uber announced that it would make the change last year to allow surveillance in the app's background, prompting a Federal Trade Commission complaint. (PDF) The Electronic Privacy Information Center said at the time that "this collection of user's information far exceeds what customers expect from the transportation service. Users would not expect the company to collect location information when customers are not actively using the app." The complaint went nowhere. However, users must consent to the new surveillance. A popup—like the one shown at the top of this story—asks users to approve the tracking. Uber says on its site that riders "can disable location services through your device settings" and manually enter a pickup address. Uber and the New York Attorney General's office in January entered into an agreement to help protect users' location data. The deal requires Uber to encrypt location data and to protect it with multi-factor authentication.